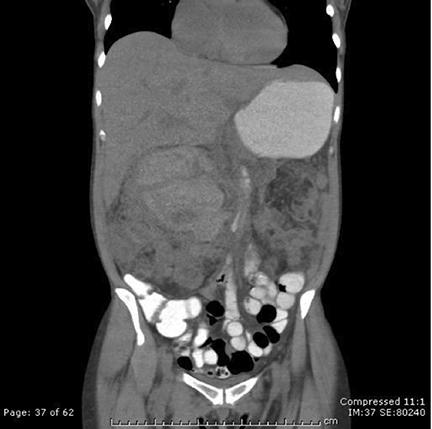 A 63-year-old female patient with history of end-stage renal disease (ESRD) and tuberous sclerosis presented to the emergency department (ED) with right flank pain. A computed tomography (CT) scan in the ED (Figure 1) revealed a new hemorrhagic mass in the upper pole of the right kidney. Three days after initial presentation, the patient’s hemoglobin levels fell by 3 units, and she was brought to IR for emergent embolization (Figures 2 and 3). 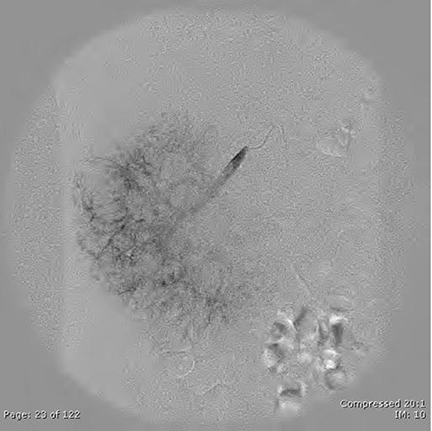 There is a high-attenuation mass in the upper pole of the right kidney consistent with a hemorrhagic lesion. The differential diagnosis includes hemorrhage from an angiomyolipoma, renal cell carcinoma, or a metastatic lesion. The presence of bilateral fat-containing renal masses as well as a history of tuberous sclerosis make hemorrhagic renal angiomyolipoma the most likely diagnosis. Angiomyolipomas (AML) are benign hamartomatous lesions composed of vessels, smooth muscle, and adipose tissue. Although80% are sporadic and solitary, 20% are multiple and associated with syndromes such as tuberous sclerosis. These lesions are generally benign except for the rare epitheliod subtype. Vessels associated with AMLs are dysplastic in nature and therefore predisposed to aneurysmal dilatation and hemorrhage, particularly when an AML is >4 cm. Therefore, embolization of lesions >4 cm is recommended.2. When there is spontaneous hemorrhage of AMLs, also known as Wunderlich’s syndrome, management options include conservative management, embolization, and nephrectomy depending on hemodynamic considerations. In the above mentioned case, the patient was actively bleeding and, therefore, could not be treated conservatively. Her hemodynamic status was stable enough to avoid surgical nephrectomy, and thus, she was an ideal patient for embolization. Bilateral angiomyolipomas are very common in patients with tuberous sclerosis.When hemorrhage is noted or when they are >4 cm,embolization is recommended. Castillo M. Neuroradiology: Core Curriculum. 1st ed. Philadelphia, PA: Lippincott Williams & Wilkins; 2002. Roth CG. Fundamentals of body MRI. Philadelphia, PA: Elsevier Saunders; 2012. Interventional Radiological Case: Hemorrhagic renal angiomyolipoma. Appl Radiol. 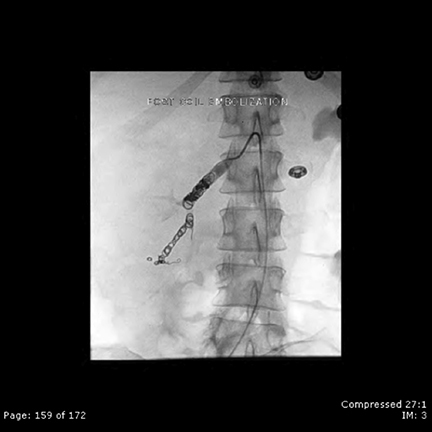 Prepared by Dr. Malhotra, a third-year resident, and Dr. Javit, an interventional radiologist, while at Lenox Hill Hospital, New York, NY.